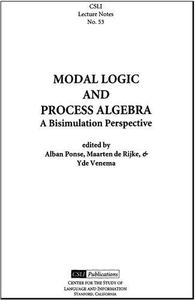 Center for the Study of Language and Inf [share_ebook] Modal Logic and Process Algebra (Center for the Study of Language and Information - Lecture Notes) by Alban Ponse, Maarten de Rijke, Yde Venema | Free eBooks Download - EBOOKEE! Posted on 2011-05-29, by sharebookfree. Labelled transition systems are mathematical models for dynamic behaviour, or processes, and thus form a research field of common interest to logicians and theoretical computer scientists. In computer science, this notion is a fundamental one in the formal analysis of programming languages, in particular in process theory. In modal logic, transition systems are the central object of study under the name of Kripke models. This volume collects a number of research papers on modal logic and process theory. Its unifying theme is the notion of a bisimulation. Bisimulations are relations over transition systems, and provide a key tool in identifying the processes represented by these structures. The volume offers an up-to-date overview of perspectives on labelled transition systems and bisimulations. 2012-04-21Robert C. Moore, "Logic and Representation (Center for the Study of Language and Information - Lecture Notes)"
No comments for "[share_ebook] Modal Logic and Process Algebra (Center for the Study of Language and Information - Lecture Notes)".